Not to be confused with Moron Airport and Air Base or Mörön Airport. 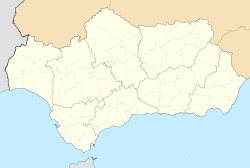 Morón Air Base (IATA: OZP, ICAO: LEMO) is located at 37°10′N 5°36′W﻿ / ﻿37.167°N 5.600°W﻿ / 37.167; -5.600 in southern Spain, approximately 35 miles (56 km) southeast of the city of Seville. The base gets its name from the nearby town of Morón de la Frontera while is located inside Arahal municipality territory. Currently the base is home to Ala 11, a fighter wing of Eurofighter Typhoons, and a maritime patrol squadron, both of the Spanish Air Force. Construction on the Vázquez Sagastizábal Military Aerodrome, as Morón Air Base was initially known, began in 1940. The following year it began to function as a military airfield and was utilised to train fighter pilots for the Spanish Army Air Force. In 1953, the Spanish and American governments finalized agreements to establish a number of Spanish-American air bases, including Morón Air Base. Morón was one of three major USAF Cold War airbases in Spain, the others being Zaragoza Air Base near Zaragoza and Torrejón Air Base near Madrid. Construction efforts began in 1953 under the direction of the United States Navy, taking over 3 years to complete. On May 13, 1958, the first flight of Boeing B-47 Stratojets were assigned to Morón Air Base to conduct Reflex operations and then Boeing KC-97 Stratofreighters arrived to conduct strip alert tanker missions, and 6 weeks later the first rotational fighter squadron, the 1st Fighter-Day Squadron, flying North American F-100 Super Sabres and commanded by Lt. Col. Chuck Yeager, arrived from George Air Force Base, CA, for temporary duty to conduct air defence alert. Morón continued to operate primarily as a Reflex base until 1962, when the first Boeing KC-135 Stratotanker aircraft arrived. In 1966, the base was transferred from Strategic Air Command (SAC) to United States Air Forces Europe (USAFE). The mission changed to communications support, Temporary Duty (TDY) "fair weather" flying operations for McDonnell Douglas RF-4C Phantom IIs from RAF Alconbury, and McDonnell RF-101 Voodoo from RAF Upper Heyford, United Kingdom and the support of air rescue operations provided by the 67th Aerospace Rescue and Recovery Squadron. 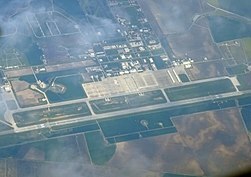 In 1971, Morón Air Base was designated to a "modified caretaker status". The Torrejón Air Base was designated as the Primary Support Base (PSB) for the Spanish Air Force. A small Spanish Air Force contingent of F-5 Freedom Fighters used the air base during the 1980s. Most of its buildings were empty and on-base services were severely limited. In November 1983, during the joint Spanish-American military exercise CRISEX 83, U.S. Air Force B-52 strategic bombers were allowed once again to enter Spanish air space and use the Morón Air Base. All B-52s had been previously banned from entering Spanish air space after the 1966 Palomares B-52 crash on January, 17, 1966, near Palomares, when a B-52G (s/n 58-0256) being refueled in midair collided with a KC-135 Stratotanker (s/n 61-0273). The B-52 was carrying four hydrogen bombs. Two of these disintegrated on impact with the ground, dispersing particles of radioactive plutonium over the landscape. One intact H-bomb landed via parachute in a stream near Palomares. The fourth H-bomb fell via parachute into the Mediterranean Sea, about 20 kilometers (12 miles) off the Spanish coast, and it disappeared into deep water. A search lasting for three months using about 12,000 men ensued to try to find the H-bomb. Despite the use of electronic detection equipment by the U.S. Navy, it was never found this way. The H-bomb was finally located after some Spanish commercial fishermen came forward, after a long delay, to say that they had seen the bomb parachuting into the sea. In 1984, Morón became a NASA Space Shuttle Transoceanic Abort Landing (TAL) site. Special navigation and landing aids were installed, and Spanish personnel were trained to recover the Space Shuttle Orbiter after an emergency landing -- one that never came. In addition during the 1980 and 1990s, U.S. Air Force airmen deployed to Morón during Shuttle launching periods to help provide onsite weather reporting. In 1990, Strategic Air Command deployed 22 KC-135 and McDonnell Douglas KC-10 Extender tankers to provide aerial refuelling for Operation Desert Shield and changed Morón Air Base's U.S. function from refueling to bomber operations. The 801st Bomb Wing (Provisional) at Morón Air Base consisted of 24 Boeing B-52 Stratofortress, 3 KC-135s and over 2,800 personnel. This was the largest deployed bomber wing during the war. During 1991, the basing plan for Spain called for retaining Morón AB, along with Torrejón Air Base, and Naval Station Rota, but on a drastically reduced scale. In 1995, the 496th Air Base Squadron (496th ABS) was activated to replace the 712th Air Base Flight. Also at this time, USAFE redesignated Morón as a limited-use base, defined as austerely manned and no permanently assigned operational tactical forces. Throughout this time it was used as a staging base to support deployments. It was heavily used during the Gulf War by B-52s and tankers and during Operation Restore Hope and Operation Allied Force. Throughout 1995 to 1997, Morón became a popular staging area to host Coronet East movements to and from Turkey and Southwest Asia with over 95 fighter and tanker missions. In 1996, the 496th was placed under the 31st Support Group of Aviano Air Base, Italy. In 1999, Morón became the home of the 92nd Air Expeditionary Wing – tasked with providing fuel to Operation Allied Force of the Kosovo War. In addition to serving as the HQ 92 AEW (serving units in France, Crete, Sicily and Spain), Morón hosted 37 tankers (KC-135 and KC-10) and 800 personnel. The 92 AEW became the largest Tanker Wing since the Vietnam War and held the distinction of being the largest tanker base during the Kosovo war. In 2001, the base provided record numbers of airlift and fighter rotations for Operation Enduring Freedom in Afghanistan. In 2003, the operations increased even more as Morón became a key pillar in the airbridge for airlift and fighter deployments in support of Operation Iraqi Freedom. In 2004, the 496th ABS started reporting to the 712th Air Base Group and was realigned under the 38th Combat Support Wing of Ramstein Air Base, Germany later that year. In 2007, the 712th ABG inactivated and the 496th ABS was realigned again under the 86th Operations Group of Ramstein Air Base. In 2011, the base once again proved its strategic importance as it served as the main tanker base for KC-10A and KC-135R aircraft supporting Operation Unified Protector in operations over Libya. The 313th Air Expeditionary Wing ("Calico Wing") and 406th Air Expeditionary Wing were activated to manage these operations. In 2013, Marine Corps temporarily based 550 Marines as part of a rapid reaction force in Morón, Spain in support of U.S. Africa Command. This unit was outfitted with Bell Boeing MV-22B Ospreys and Lockheed Martin KC-130J aerial refueling / cargo aircraft. An advance element from this unit moved to Naval Air Station Sigonella in May. Morón's massive flight line, in-ground aircraft refueling system, long runway and prime location on the Iberian peninsula, close to the Mediterranean and the Middle East, means the base is an important link in any operation moving east from the United States. In May 2015 the Spanish government approved an agreement granting the U.S. military a permanent presence on the base. Under the agreement, up to 3,000 American troops and civilians of the Special Purpose Marine Air-Ground Task Force - Crisis Response - Africa can be stationed there, while the number of aircraft can be increased to 40, up from the previous limit of 14. A detachment of the 18th Space Surveillance Squadron (USAF) was also previously located at the base. The base is run under the Turkey Spain Base Maintenance Contract (TSBMC). 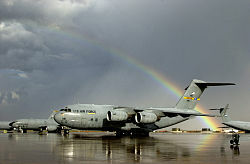 Specific services include the fueling of US Air Force planes, Fire Fighting, Dining Facility (Food Services), Occupational Health, Ambulance Services, Communications, Postal Services, Safety, Civil Engineering, Lodging, Library, Fitness Center Equipment Maintenance, & Life Guard/Pool Services), Logistics Support Services, Contingency/Exercise Support, and limited support of the Zaragoza Air Base controlled by the Spanish Air Force. The contract does not cover local base security, MWR, and pastoral care. The contract has historically been awarded for a period of four year intervals; however, the current contract, held by Vectrus —known as Turkey-Spain Base Maintenance Contract (TSBMC)-and combines USAFE operations in Turkey and Spain. The Base's climate is characterized by the annual alternation between a dry period, which lasts more than four months and which has high temperatures, and another one humid (autumn-winter) with mild temperatures. The monthly distribution of rain corresponds to one typical of the Mediterranean climate; the rain season takes place during the autumn and the winter; during the summer the absence of rain is the prevailing rule, except for very occasional summer storms. 41% of the rain happens during the autumn. The average annual temperature is 17.5°C (63.5°F). The average absolute maximum temperature is 41.9°C (107.4°F). The coldest month is January and the average absolute minimum temperature is 0.8°C (33.4°F). Summing up, the climate is excellent, although slightly harsh in the summer. The sun and a cloudless sky are predominant most of the time. On 9 June 2014, at around 14:00 CEST (12:00 GMT), a pilot died after his Eurofighter Typhoon crashed whilst landing on the runway at the base. A Saudi pilot also crashed in August 2010. ^ "US Repositioning 200 Marines in Italy as Precaution for Libya Unrest." ^ "Archived copy". Archived from the original on 2015-05-29. Retrieved 2015-05-30. CS1 maint: Archived copy as title (link) "Spain makes US rapid force at Moron base permanent"
^ "Eurofighter crashes at Spain's Moron base near Seville". BBC News. 9 June 2014. Archived from the original on 9 June 2014. ^ Staff, By the CNN Wire. "Saudi pilot dies in Spanish military crash - CNN.com". cnn.com. Archived from the original on 4 March 2016. Retrieved 9 May 2018. Airport information for LEMO at World Aero Data. Data current as of October 2006.